Amit Dhanker gave Punjab Royals a much-needed win clinching the last bout against Praveen Rana 4-2 in the men’s 74kg category and help his team earn a 4-3 win over Haryana Hammers and make it to the semi-final of the Pro Wrestling League (PWL) Season 4 currently underway at the Gautam Buddha University Indoor Stadium in Greater Noida on Saturday. 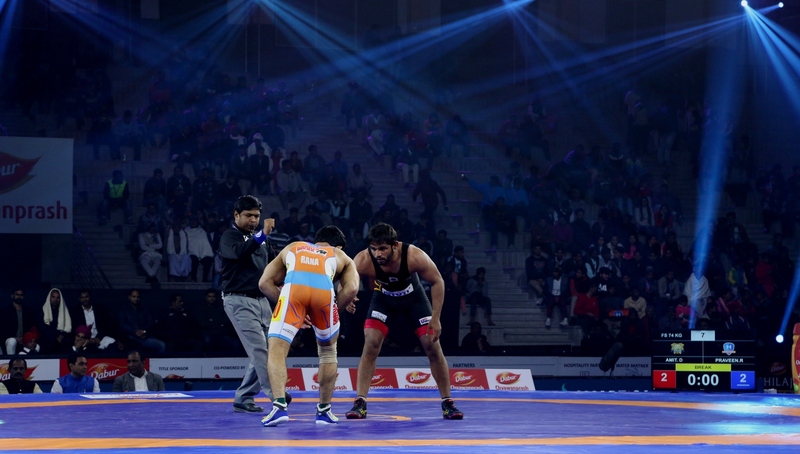 Greater Noida, January 26, 2019: Amit Dhanker gave Punjab Royals a much-needed win clinching the last bout against Praveen Rana 4-2 in the men’s 74kg category and help his team earn a 4-3 win over Haryana Hammers and make it to the semi-final of the Pro Wrestling League (PWL) Season 4 currently underway at the Gautam Buddha University Indoor Stadium in Greater Noida on Saturday. Before Amit, Cynthia Vescan, Bajrang Punia and Dato Magarishvili won their respective bouts to cement their place in the semi-final. It was Bajrang’s first match after conferred with the Padmashree and he won it quite convincingly. Earlier, the new find of PWL-4 in the men’s section Ravi Kumar of Haryana Hammers carrying his fine form forward defeated Nitin Rathi of Punjab Royals 9-2 in the men’s 57kg category to give his team an early lead. The 2018 European championships bronze medallist Cynthia Vescan brought Punjab Royals back to the tie winning the women’s 76kg bout against Kiran of Haryana Hammers 4-3 in a closely fought encounter. Padmashree and world championships silver medallist Bajrang Punia of Punjab Royals didn’t let the advantage slip getting the better of countrymate Rajneesh 6-2 in the men’s 65kg category and give his team a 2-1 lead in the tie. The 2018 national championships gold medallist Rajneesh gave a tough fight but the world No. 1 in the 65kg category, Bajrang was too good for him today. World junior champion Anastasia Nichita got the Haryana Hammers back into the tie scoring a massive 13-0 win over the European Championships silver medallist Mimi Hristova in a completely one-sided encounter filled with a takedown, near fall, leg-rolls et all. Both teams were tied 2-2 after the fourth bout of the evening. It was the European Championships bronze medallist Dato Magarishvili’s massive comeback win over World Championships bronze medallist Ali Shabanov in the men’s 86kg category which tilted the tie in Punjab’s favour. 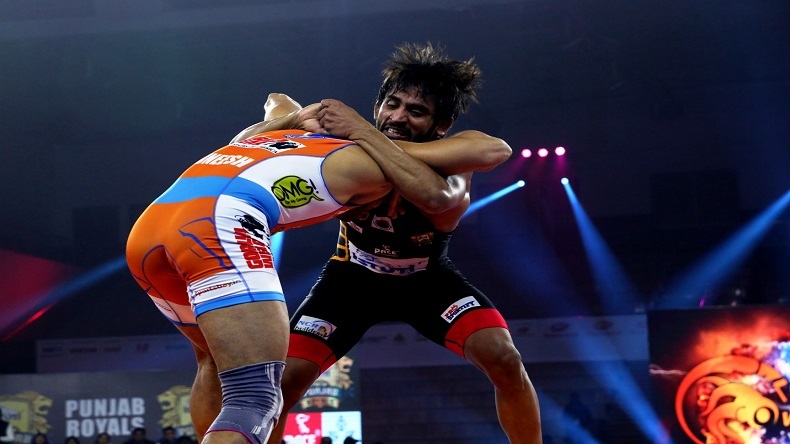 Dato was trailing 2-4 midway through the second round but a near pin fall gave Dato a 7-4 win and the defending champions Punjab Royals the edge going into the next two bouts. The 19-year-old Anju of Punjab Royals showed a lot of promise early in the bout but the experienced 2017 Commonwealth Championships gold medal winner Seema kept the younger wrestler at bay and win the bout 8-2 and push the tie to the decider.